The cool new AdHoc Tea Egg is a handy tea infuser with a built-in rotatable hourglass timer that stays in place with magnets. 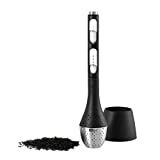 Just fill the stainless steel infuser egg with your favorite loose leaf tea, insert it into boiling water, and give the 2-5 minute hourglass a flip. The number of minutes are listed along the side so you know how much time has elapsed as the sand falls and it includes a drip-free stand to place the infuser when it's finished steeping. Makes a unique gift for tea lovers.